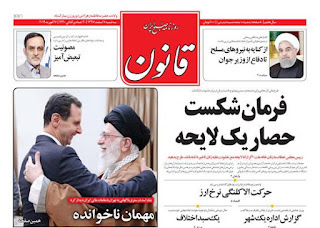 Last Tuesday , On an order by the " cultural and media department of the public prosecutor office" " Ghanoon " newspaper has been temporarily suspended due to its front page title . This has happened based on the article 576 of the Islamic penal law. 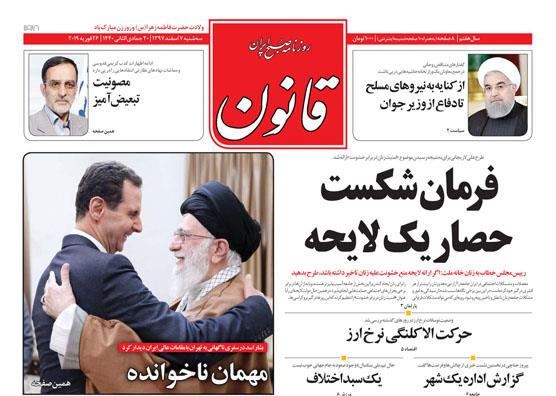 The front page title of the " Ghanoon " newspaper , " The Uninvited Guest " was because of the visit by Syrian president Bashar Al Asad to Iran . Apparently the sentencing " uninvited Guest " description of the visit by an ally to Iran was offensive to the regime security forces. This is not the first time that " Ghanoon " is suspended from printing , in the past it was also suspended for two time . 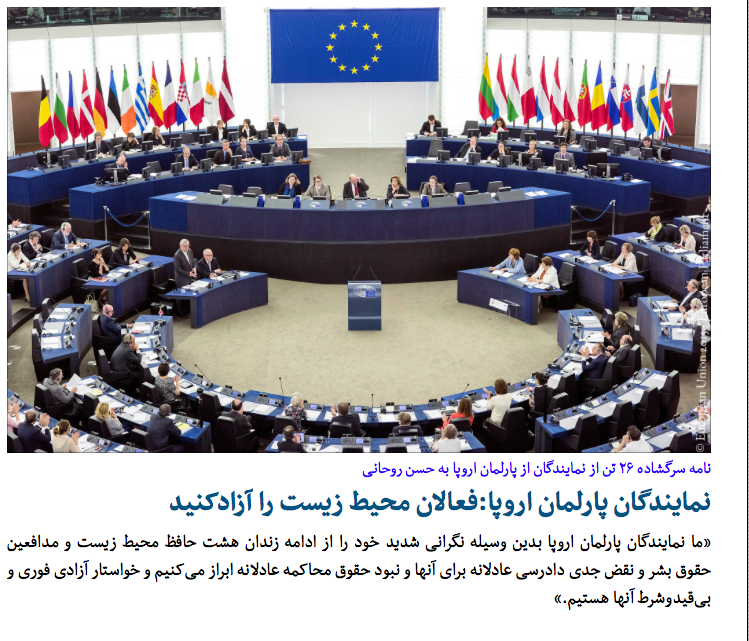 In an open letter 26 members of the EU parliament demanded from Hassan Rohani the president of the Islamic regime in Iran to release immediately and unconditionally all human rights activists and human rights defenders from prison. The letter also demanded the prisoners to have right to lawyer and open and righteous trial . The Iranian authorities must immediately halt plans to execute three young men who are on death row for crimes that took place while they were under the age of 18, said Amnesty International. The organization has learned that Mohammad Kalhori, Barzan Nasrollahzadeh and Shayan Saeedpour, who were all convicted for separate crimes that took place while they were minors, are at risk of imminent execution. “The Iranian authorities must act quickly to save these young men’s lives. Failing to stop their execution would be another abhorrent assault on children’s rights by Iran. International human rights law strictly prohibits the use of the death penalty against people who were under the age of 18 when the crime was committed,” said Saleh Higazi, Deputy Middle East and North Africa Director at Amnesty International. Iran is one of a handful of countries that continue to execute juvenile offenders in flagrant violation of international law. Over the past three years the Iranian authorities have stepped up such executions. The organization is aware of more than 90 cases of people in Iran currently on death row for crimes that took place while they were under 18, though the real number is likely to be far higher. 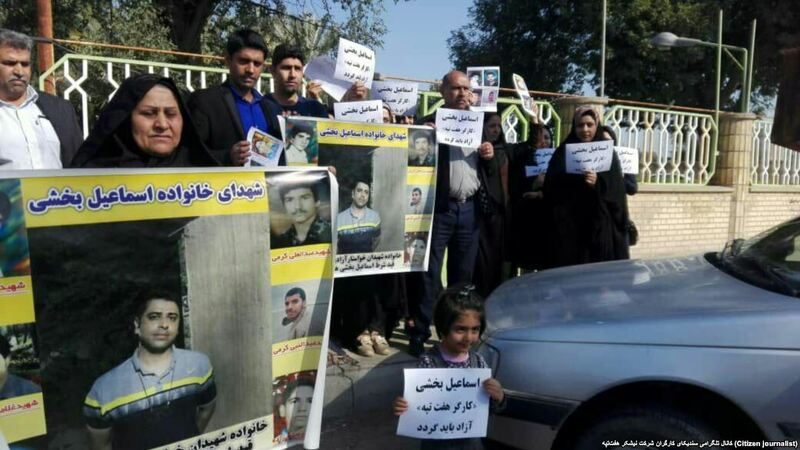 “The Iranian authorities have a horrific track record of putting juvenile offenders to death in flagrant violation of international law and its own human rights obligations,” said Saleh Higazi. As a state party to the Convention on the Rights of the Child Iran is legally obliged to treat everyone under the age of 18 as a child and ensure that they are never subject to the death penalty. Amnesty International has also noted an alarming pattern of the Iranian authorities scheduling executions of juvenile offenders at short notice to minimize the chances of public or private interventions to save people’s lives. Mohammad Kalhori was 15 years old when he was arrested in December 2014 over the fatal stabbing of one of his schoolteachers. Branch One of the Provincial Criminal Court of Lorestan Province found him guilty of murder in March 2016. He was initially sentenced to three years in prison and ordered to pay “blood money” (diyah) to the victim’s family. In its verdict, the court relied on a state medical opinion which concluded that he did not have “mental growth and maturity” at the time of the crime. in January 2017, Branch Two of the Provincial Criminal Court of Lorestan Province dismissed any arguments about Mohammad Kalhori’s “mental growth and maturity” and convicted him of murder sentencing him to death. At least two judicial reviews of his case since then have been rejected and his family have now been told by the prosecutor’s office that his death sentence will be implemented soon. Under Iran’s Islamic Penal Code judges have the discretion to replace the death penalty with an alternative punishment if they determine that the juvenile offender did not understand the nature of the crime or its consequences, or that there were doubts about his or her “mental growth and maturity” at the time of the crime. Barzan Nasrollahzadeh was arrested by Ministry of Intelligence officials at the age of 17 in Sanandaj, Kurdistan Province in May 2010. He was held for several months in a Ministry of Intelligence detention facility in Sanandaj without access to his family or a lawyer. He has said that during this period he was tortured, including with an electric-shock device, by being suspended upside down, and beaten. After his trial in August 2013, he was sentenced to death after being convicted of “enmity against God.” He is currently held in Raja’i Shahr prison, Karaj. His request for judicial review of his case has been rejected, which means that his sentence may be sent for implementation soon. Shayan Saeedpour was arrested at 17 after surrendering himself at a police station for the murder of another person during a fight in August 2015. In October 2018 branch One of Kurdistan’s criminal court sentenced him to death for first degree murder and to 80 lashes for drinking alcohol. Amnesty International is calling on Iran’s parliament to urgently amend Article 91 of the 2013 Islamic Penal Code to abolish the death penalty for crimes committed by people under 18 in line with Iran’s obligations under the International Covenant on Civil and Political Rights (ICCPR) and the Convention on the Rights of the Child (CRC). The organization is also calling on doctors affiliated with Iran’s Legal Medicine Organization, an organization which provides courts with medical opinions on the “maturity” of persons convicted of crimes committed when they were still children, not to give medical legitimacy to judicial processes that lead to executions of people who were under 18 at the time of the crime. Amnesty International opposes the death penalty in all cases without exception regardless of the nature of the crime, the characteristics of the offender, or the method used by the state to execute the prisoner. The death penalty is a violation of the right to life. 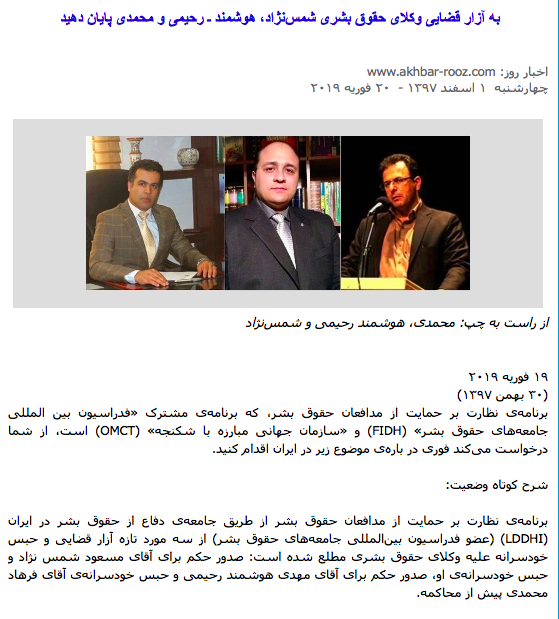 In a statement, FIDH & OMCT demanded from regime to stop harassing and imprisoning the Iranian human rights lawyers. According to news , Masoud Shamsnejad ( lawyer) , Mehdi Houshmand Rahimi ( lawyer ) and Farhad Mohammadi ( lawyer ) are the human rights lawyer who were arrested / detained or harassed recently by regime security agents. Mr. Masoud Shamsnejad is a university professor and defence lawyer of several Kurdish political prisoners. On Feb. 10, 2019 branch number 3 of the court of revolution has sentenced him to six years imprisonment. He is arrested on Jan. 8 in the city of Orumieh . The security agents searched his office and home and took away his files and materials. Mr. Farhad Mohammadi is a Kurdish lawyer and is arrested in the city of Sanandaj . He is also an environmental advocate. 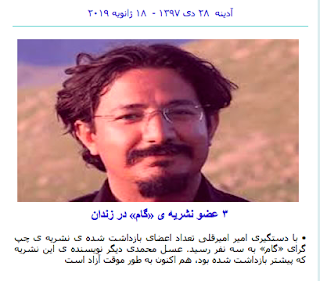 Mr. Mehdi Houshmand Rahimi is sentenced to two years imprisonment by the court of revolution in the city of Arak . Mr. Rahimi later by another court was sentenced to five years imprisonment. The statement demanded those arrested immediately and unconditionally be released. 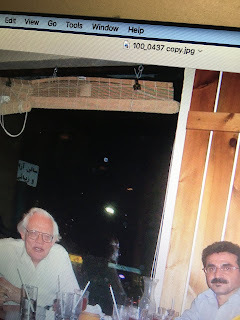 While working on human rights issues in Iran with human rights organizations several years ago, i had the privilege working with Mr. Capithorne and had invited him to Toronto to speak with the Iranian community about his experience. fortunately he spoke two times to the Iranian community here in Toronto and informed us about his experience while as UN reporter. I just called and spoke with Asa his son and expressed our condolence to him and his mother Tama . 2009. "Copithorne, Maurice. Helping To Make A Democratic Iran. Mokhtar Asadi is a very popular and active teacher in Kurdistan . He is a member of Iran teachers union . He was arrested last week by the security agents in the city of Sanandaj and was transferred to an unknown location. 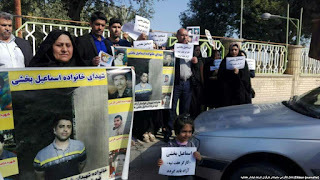 On Monday last week, the family members including the mother of Esmail Bakhshi the spokesperson of the " Haft Tapeh Workers " including some workers from Haft Tapeh gathered in front of the judiciary power building in the city of Shoosh and demanded about the situation of Esmail Bakhshi . A day earlier Email Bakhshi's mom was attacked by the security agents at her home and was transferred to the hospital . Ms. Parvin Mohammadi a well known labor activist and vice president of the " Free Workers Union" together with Jafar Azimzadeh is arrested . 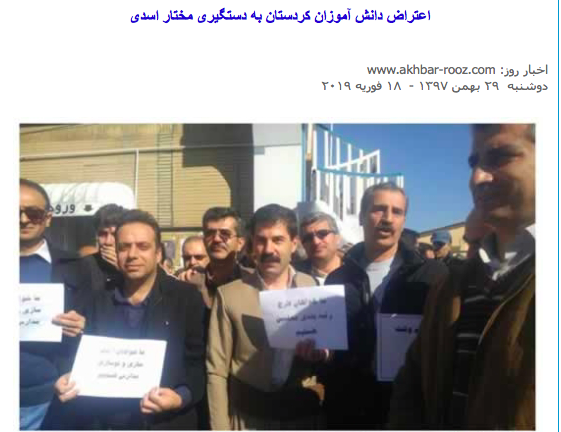 This is happening because of the pressure the regime put on labor activists in recent months. Its been two weeks the family members of Parvin have no news from her . 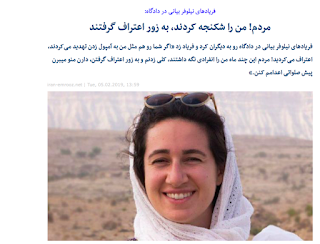 The officials at Evin prison told to her sister that, she is going to contact the family soon. All her family including her sick mom are worried on her situation. The third court session of the environmental activists were held without legitimate lawyer for them and under judge Salavati the infamous judge . In this court the security forces of the regime reported about a new confession film from the environmental activists , a tactic to discredit the work of these environmental activists which is taken under pressure inside the prison. 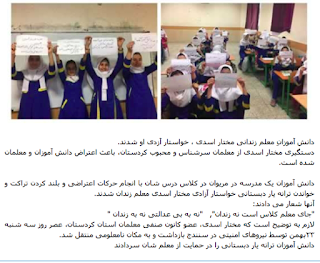 This was happening while the families of this activists sent a letter to the Khamenei and demanded their loved one be released. the court only accepted those lawyers who were selected by them. Iran Watch Canada: A circus called court of revolution by a judge as infamous as Abolghasem Salavati. After 30 years in hiding, Salman Rushdie the Indian- British writer who was threatened to death by Ayatollah Khomeini because of his book The Satanic Verses ( 1988) for blasphemy says , he no longer want to live in hiding. 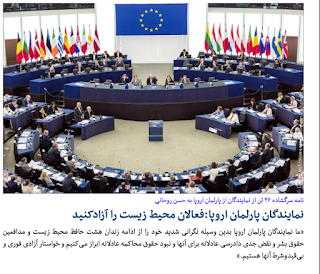 Hassan Rohani the president of the Islamic regime in Iran in his speech on the 40th anniversary of the revolution said, Political parties are free in Iran and there is freedom of expression in Iran . 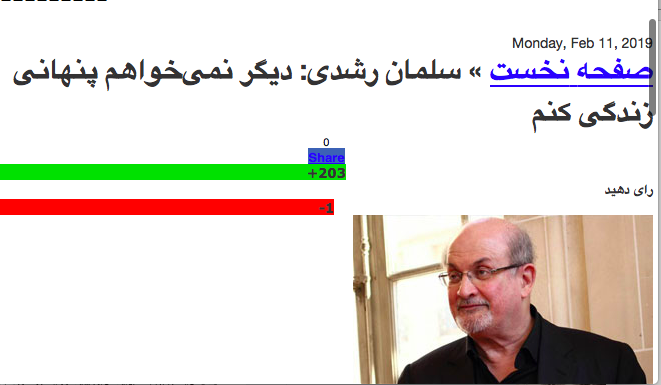 Not only there is no freedom of expression in Iran, but the regime also threatens the freedom of expression of others around the world including Salman Rushdie . 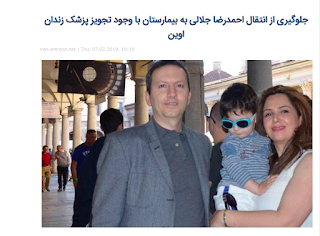 Evin prison officials has denied medical attention to Ahmad Reza Jalali the Iranian - Swedish doctor and researcher on " crisis management " despite of the order by the doctor at the prison. Vida Mehran-Nia the wife of Mr. Jalali believe her husband is suffering from some sort of cancer related illnesses . 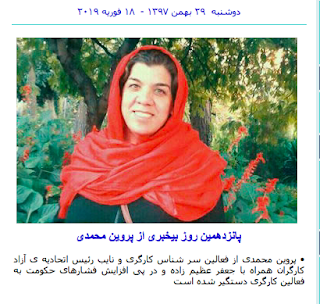 She said, her husband had an appointment with an specialist in a hospital but was denied despite of recommendation by doctor at Evin prison. he was denied the medical treatment because Mr. Jalali refused to wear the prison uniform . Mr. Jalali was attending in a conference in Tehran when he was arrested by intelligence agents and brought to Evin prison. He is accused of " Corruption on earth " and is sentenced to death . With the arrest of Amir Amirgholi the number of those arrested has reached to three writers . Earlier Asal Mohammadi another writer of this publication was also arrested but is temporarily released . Nilofar Bayani An Environmental Activist Inside The Court To The People : They Have Tortured Me And Forced Me A To A Confession !!?? Nilofar Bayani inside the court to the people : " If they have threatened you inside the prison like me to an injection, you would have confessed like me . They have kept me in the solitary confinement for several months and beaten me up and forced me to a confession. They are about to bring me to the judge Salavati to kill me. " Torture , solitary confinement , forced confessions, threatening to kill the prisoners and their loved one are common in the Islamic prisons in Iran. 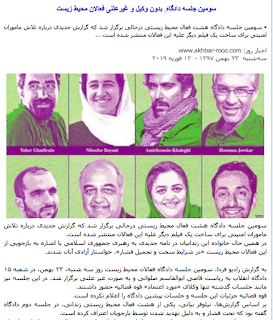 In the past they have killed so many including young blogger Satar Beheshti , Kavous Seyed Emami and so many others . According to news , three members of the Iranian writers Association are arrested and detained . According to report by the association , they were summoned to the Islamic court of revolution and were arrested and detained. The association lawyers Naser Zarafshan and Razieh Zeidi were to defend these writers but the judge of the court Judge Moghiseh denied their right to a lawyer. (Beirut, February 5, 2019) – Iran’s judicial authorities are violating fair trial standards in the case of eight environmentalists who have been detained for over a year, Human Rights Watch said today. Authorities should immediately open an impartial and transparent investigation into the torture allegations the accused have raised during the trial. On January 30, 2019, Houman Jokar, Sepideh Kashani, Niloufar Bayani, Amirhossein Khaleghi, Sam Rajabi, Taher Ghadirian, Abdoreza Kouhpayeh, and Morad Tahbaz, members of a local environmental group, the Persian Wildlife Heritage Foundation, appeared in court for the opening of the trial on accusations of spying. Branch 15 of Tehran’s revolutionary court, which is overseeing the trial, did not allow the defendants’ lawyers to review the indictment prior to the session. Judge Abdolghassem Salavati of Branch 15 also restricted the defendants’ choices for lawyers to a list approved by the judiciary. During the trial, one of the detainees interrupted the session, claiming that they were tortured and coerced into making false confessions, a source confirmed to Human Rights Watch. On January 30, Mohammad Hossein Aghasi, a lawyer Rajabi has chosen to represent him, tweeted that he had not been allowed to represent his client in the court. Two sources who asked not to be named due to the risk of reprisal, said that the 300-page indictment against the environmentalists is solely based on a forced confession in detention. During the second trial session, on February 2, Bayani stood up, said that she rejected the accusation of spying, and described abuse she said she had experienced in detention. “If you were being threatened with a needle of hallucinogenic drugs [hovering] above your arm, you would also confess to whatever they wanted you to confess,” Bayani told the court on February 2, a source with close knowledge of the case confirmed. The Revolutionary Guards’ Intelligence Organization arrested seven of the defendants on January 24 and 25, 2018, as well as Kavous Seyed Emami, an Iranian-Canadian university professor. The authorities arrested another environmentalist, Abdoreza Kouhpayeh, on February 25, who is being tried with seven other activists. On February 10, 2018, family members of Seyed Emami reported that he had died in detention in suspicious circumstances. Iranian authorities claimed that he committed suicide, but they have not conducted an impartial investigation into his death and have placed a travel ban on his wife, Maryam Mombeini. On October 24, 2018, Abbas Jafari Dolatabadi, the Tehran prosecutor, said at a news conference that the authorities had finalized indictments for the activists. 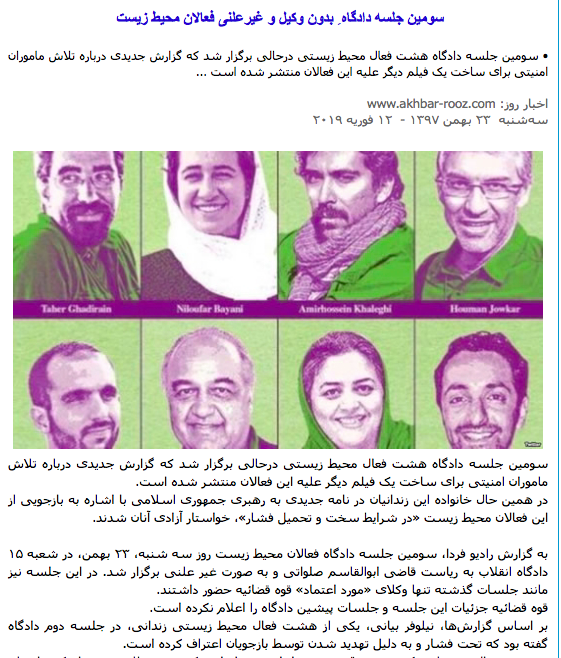 He said that four face the charge of “sowing corruption on earth,” which includes the risk of the death penalty, claiming that the activists were “seeking proximity to military sites with the cover of the environmental projects and obtaining military information from them.” On January 30, the Islamic Republic News Agency reported that three others are charged with spying and one person is charged with assembly and collusion against national security. Several senior Iranian government officials have said that they did not find any evidence to suggest that the detained activists are spies. On May 22, the Iranian Student News Agency (ISNA) reported that Issa Kalantari, the head of Iran’s Environmental Institution, said during a speech at a biodiversity conference that the government had formed a committee consisting of the ministers of intelligence, interior, and justice and the president’s legal deputy, and that they had concluded there was no evidence to suggest those detained are spies. 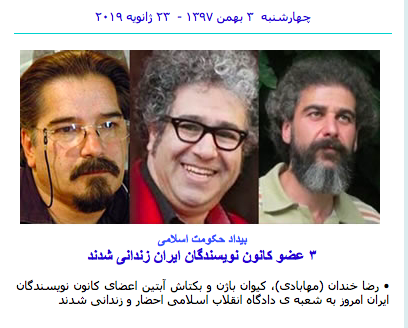 On February 3, Mahmoud Sadeghi, a member of Parliament from Tehran, tweeted that according to the information he has received, the National Security Council headed by President Hassan Rouhani also did not deem their activities of the detained conservation activists to be spying. 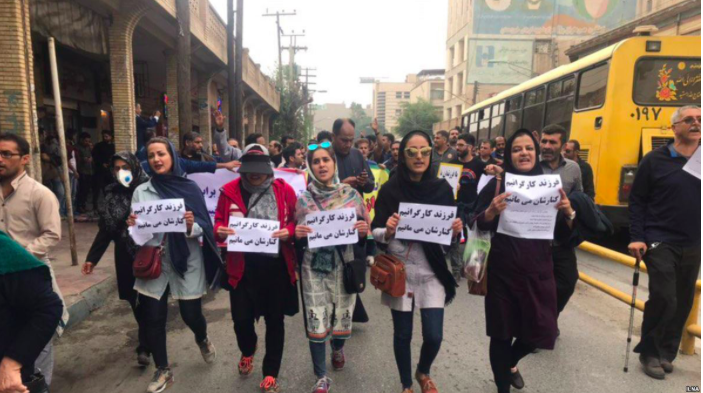 In January, two labor rights activists, Ismael Bakhshi and Sepideh Gholian, also alleged that they had been tortured when the authorities detained them in November. Instead of conducting a transparent investigation of their allegations, the authorities arrested both activists shortly after in what appears to be an act of reprisal. Torture and cruel, inhuman, or degrading treatment are banned at all times, and evidence obtained by torture or other coercion may not be submitted as evidence in a trial. Under the Convention Against Torture, torture is defined as the deliberate infliction by state officials of severe pain or suffering, physical or mental for a particular purpose such as obtaining a confession. Under the Convention, torture is also a crime of universal jurisdiction, meaning that the authorities are required to arrest and investigate anyone on their territory credibly suspected of involvement in torture anywhere and to prosecute them or extradite them to face justice. IRAN WATCH CANADA online Is managed by Morteza Abdolalian (Mori) .It is the continuation of Iran Watch bulletin (print) since 2004 .It monitors daily news about Media,journalists and human rights in Iran.It defends press freedom,freedom of expression,Freedom of Information and Human Rights Activists in Iran and around the world.It has no affiliation to any political organizations.It is illegal using Iran Watch Canada without mentioning it as the source.